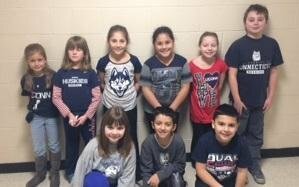 Students at Wakelee Elementary School showed their support for the UConn Huskies sports teams by wearing their favorite UConn gear on Friday. This was part of a series of School Spirit Days that were put in place to bring the school together. Students could be seen in UConn football and basketball jersies, as well as hoodies and tshirts. The students enjoyed showing off their UConn pride with their friends and teachers.